Charlotte, NC, March 23, 2019 – Martin Necas had a goal and an assist, and Alex Nedeljkovic made 31 saves Saturday night at Bojangles’ Coliseum, as the Charlotte Checkers defeated the Hartford Wolf Pack 3-1, in the first of back-to-back games between the two teams in Charlotte. 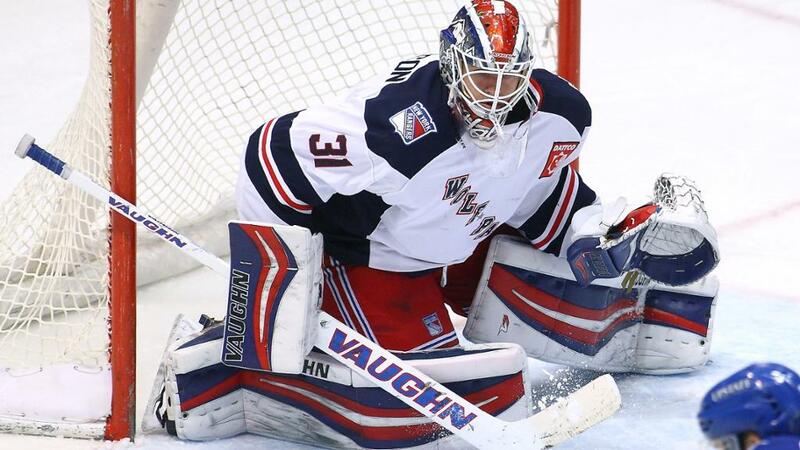 Shawn St. Amant scored the only Wolf Pack goal, and Brandon Halverson made 23 saves in the Hartford net. Patrick Brown and Julien Gauthier had the other Checker goals, and Jake Bean had two assists. The loss dropped the Wolf Pack to 0-9-0-0 all-time at Charlotte. Two of Charlotte’s three goals were power-play scores, and the other came one second after a man advantage ended. The Wolf Pack got off to a strong start in the game, with seven of the first eight shots, but St. Amant was hit with a delay-of-game penalty at 9:13, after he cleared the puck out of play, and the Checkers capitalized. Halverson stopped a shot from the right-wing circle by Tomas Jurco, but the rebound went off of Halverson’s stick right to Necas at the left side of the slot, and he quickly fired the puck in. Brown increased the Charlotte lead to 2-0 just 1:15 into the second period, one second after a kneeing penalty to Brandon Crawley expired. Andrew Poturalski passed the puck from the right-wing boards to Brown along the goal line, and he stepped in front and flicked a shot past Halverson. The Wolf Pack got on the scoreboard at 6:02, with St. Amant scoring his third goal of the season and second in two games. St. Amant got the puck to Ryan Dmowski, playing his first pro game out of U. Mass-Lowell, behind the net, and he centered it into the slot. That pass found St. Amant, driving the middle, and he fired the puck past Nedeljkovic on the glove side. Dmowski was one of three players making their Wolf Pack debuts in the game. Nick Jones, fresh out of the University of North Dakota, was also seeing his first pro action, and eighth-year pro defenseman Matt Register played his first Wolf Pack game, up from Toledo of the ECHL. The Checkers restored the two-goal margin at 13:30, with their second power-play goal of the game. With Matt Beleskey off for tripping, Tim Gettinger was unable to poke the puck past Bean at the left point, and he found Gauthier all alone in front of Halverson. Gauthier had time to make a move to the forehand, and he beat Halverson from close range. That was the extent of the scoring, despite a 14-3 shots advantage for the Wolf Pack in the third period. The Wolf Pack and Checkers go back at each other Sunday afternoon at Bojangles’ Coliseum, with faceoff at 3:00 PM. All of the action can be heard live on News Radio 1410 AM, and 100.9 FM, WPOP, and on-line at www.newsradio1410.com and iHeartRadio. Video streaming is available at theahl.com/AHLTV. The Wolf Pack’s next home game is this Friday, March 29, also against the Checkers, a 7:15 PM faceoff. As at all Friday-night Wolf Pack home games, fans can enjoy $1 hot dogs, and $2 beers and fountain sodas, through the start of the second period, presented by Nomads Adventure Quest. 2nd Period-2, Charlotte, Brown 16 (Poturalski, Carrick), 1:15. 3, Hartford, St. Amant 3 (Dmowski), 6:02. 4, Charlotte, Gauthier 20 (Bean, Necas), 13:30 (PP). Penalties-Beleskey Hfd (tripping), 12:39. 3rd Period- No Scoring. Penalties-Bean Cha (interference), 2:14. Goalies-Hartford, Halverson 7-6-3 (26 shots-23 saves). Charlotte, Nedeljkovic 31-7-5 (32 shots-31 saves).